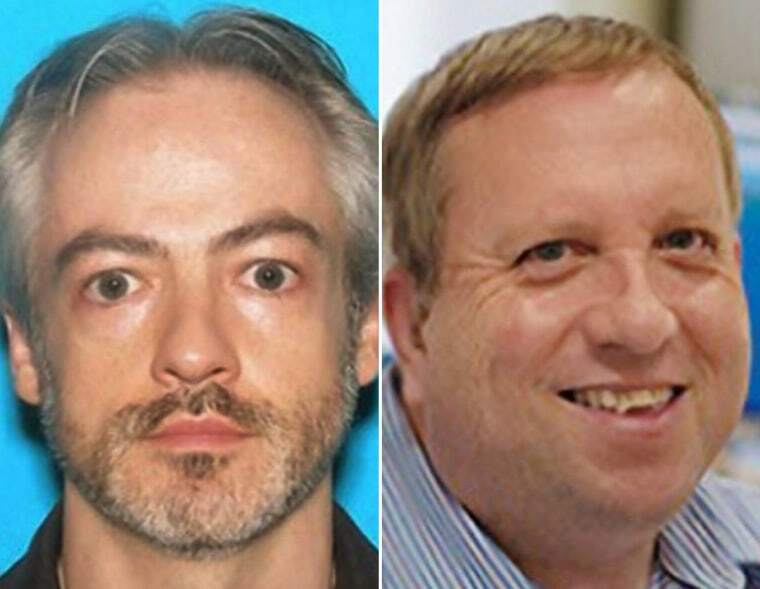 An associate professor at Northwestern University and an Oxford University employee wanted in connection with a murder in Chicago surrendered separately to authorities in California on Friday, ending a nationwide manhunt, a U.S. Marshals official said. Associate professor Wyndham Lathem surrendered to marshals at the Oakland federal building at around 7:30 p.m. local time (10:30 p.m. ET) and Andrew Warren surrendered at a police station in San Francisco, U.S. Marshals Supervisory Deputy Frank Conroy said. Warrants for first-degree murder had been issued for both men Monday for their alleged involvement in the death of Trenton H. James Cornell-Duranleau, who was found stabbed to death in a luxury Chicago apartment on July 27. "Wyndham surrendered peacefully and we didn't have any issues with him," Conroy said in a phone interview. "It was a long nationwide manhunt, a very important case, especially for the city of Chicago, and we are hopeful this arrest brings closure to the victim's family." Chicago police spokesman Anthony Guglielmi said detectives will interrogate Lathem and Warran once they are returned and police will publicly detail the cases against them after those interrogations. "Both individuals will be held accountable for their actions," Guglielmi said in an email. Police said they will outline their case against the two suspects after the interrogations take place. Lathem, 42, is an associate professor of microbiology and immunology at Northwestern University and has been a faculty member in the department since 2007. Warren, 56, is a senior treasury assistant at Oxford University. Lathem and Warren will appear in Alameda and San Francisco county courts and will have extradition hearings, Conroy said. Alan K. Cubbage, vice president for media relations for Northwestern University, said Saturday that Lathem "was in the medical school so he taught medical students or graduate students sometimes but he was primarily a researcher." Cubbage said Lathem never taught undergraduate students, was not teaching at the time and he was not scheduled to teach in the fall. Guglielmi has said that police got a call the Grand Plaza building manager who had received a cryptic tip that something had occurred in apartment 1008, and police found Cornell-Duranleau dead. Guglielmi said Lathem and Warren were confirmed to be at the building by security cameras. Lathem lived in the apartment that was identified as the crime scene, he said. On Friday Chicago police said Lathem had sent a video message to various friends and family members apologizing for his involvement in the killing. Police also said the two suspects made a $1,000 donation to a Wisconsin library in Cornell-Duranleau's name, police said.